The role of the Executive Chef is an overarching position with responsibility which sometimes is hands off when it comes to the preparation of the food or will see them cooking only on special occasions. It’s a position which is often associated with someone who has a number of restaurants to manage and the executive chef will be the main management contact with any area related to the workings of the kitchen. An executive chef usually creates and manages the menu choices. This is a daily duty in some circumstances and will be the first task of the day. There will be an allotted budget and it is the responsibility of the executive chef that the menu for the day is within this budget. They will also order the ingredients required as well as purchasing utensils and equipment and ensure that positive relationships are maintained with their suppliers. As one of the major responsibilities is menu creation, the executive chef will be the team member who keeps up to date with current food and ingredient trends. They will then design the menus accordingly so the offering to the customers is current and includes elements which may be fashionable or in favour. At times, or depending on the size of the team, executive chefs will share responsibilities with the sous chef. When the dishes are complete, they will sometimes take on a quality control role as well as allotting tasks to each member of the team at the beginning of a service or in the preparation stage at the beginning of the day. This can include the washing and slicing of the vegetables by junior chefs or the preparation of specific meat cuts for particular courses. Outside the kitchen, the executive chef will have staff management responsibilities for all those working in the kitchen – or kitchens if there are a number they have responsibility for. All accountancy matters will pass through the hands of the executive chef and they will take up disciplinary matters with staff where required. Marketing and customer satisfaction may be included in the responsibilities of the job description of an executive chef. Every restaurant wants customers to return and so the executive chef will monitor levels of satisfaction in the food served and take action where necessary. 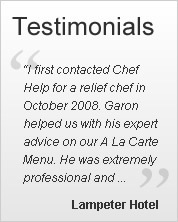 An executive chef is an expert in their field of top quality food preparation and cooking. They will be strong managers and have a wide variety of non-kitchen related skills as well as being dedicated to the cuisine being served. It’s a demanding role but a very rewarding one for the kind of chef who is incredibly organised, an excellent planner and knows the meaning of offering the very best meal that money can buy. If you require the senior management expertise of an executive chef to manage the day to day running of your kitchens or you need someone with knowledge of menu choices who can provide your customers with on-trend dishes they will want to return to time and time again, talk to Chefhelp who can provide you with fully qualified, dedicated staff members for either temporary or permanent positions.